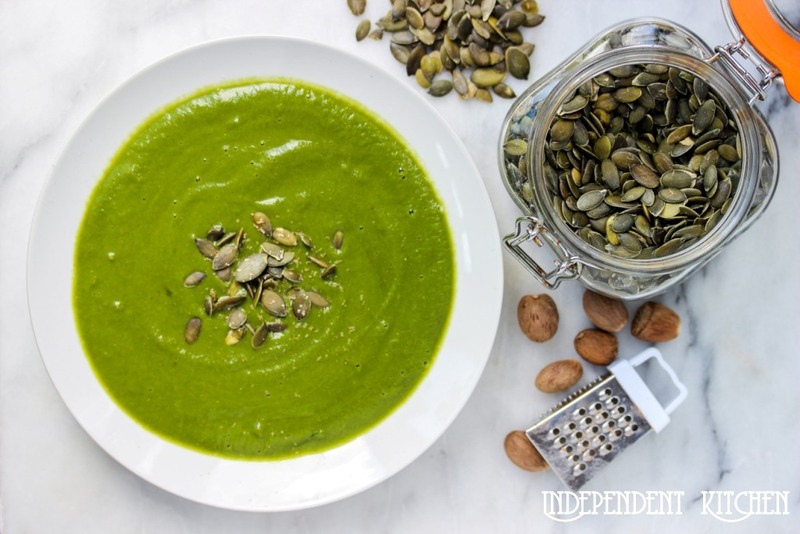 This iron-rich spinach soup with basil walnut pesto soup only takes 10 minutes to make and uses mainly store cupboard ingredients, so is an excellent weekday meal. 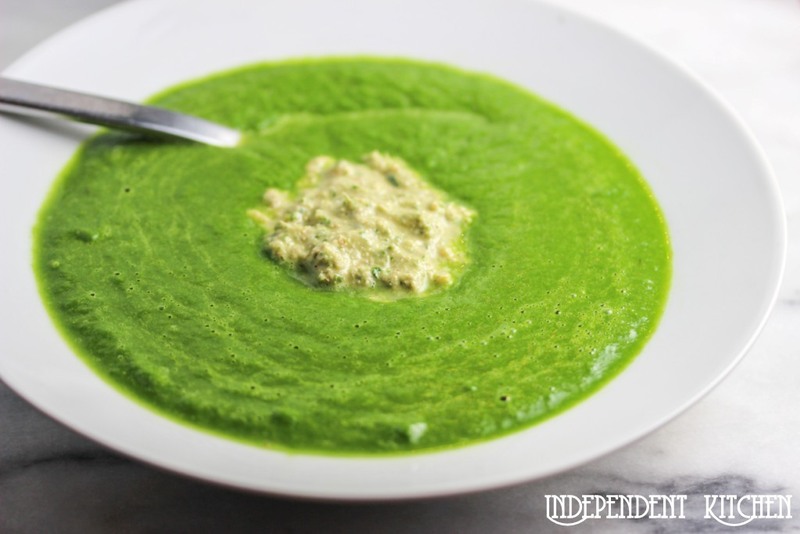 The pesto adds a hit of flavour and protein to this already fibre rich soup, perfect for satiating hunger. The weather has taken a turn for the worse these past few days in South West England, and soup is my go-to recipe in blustery weather. 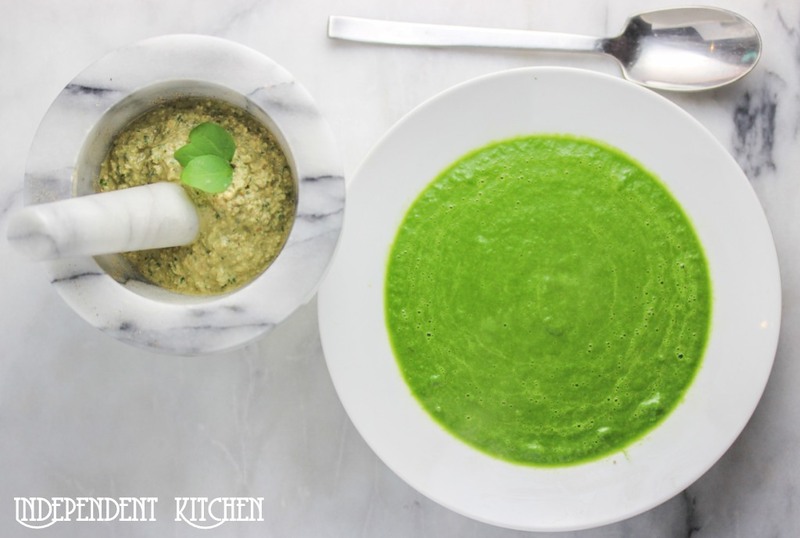 Surprisingly I haven’t included many soup recipes on the blog yet (granted I now have 2 spinach recipes), but that is soon to change as we are plunged into Britain’s dark wintry nights. I made enough for 5-6 meals to last me through the week, but if you don’t like eating the same meal for a few days it is also fine to freeze both the soup and the pesto for an easy stand by lunch or light dinner. As I mentioned in my Spinach Tahini Chickpea Soup recipe the trick to keep the green colour is not to overcook the spinach. 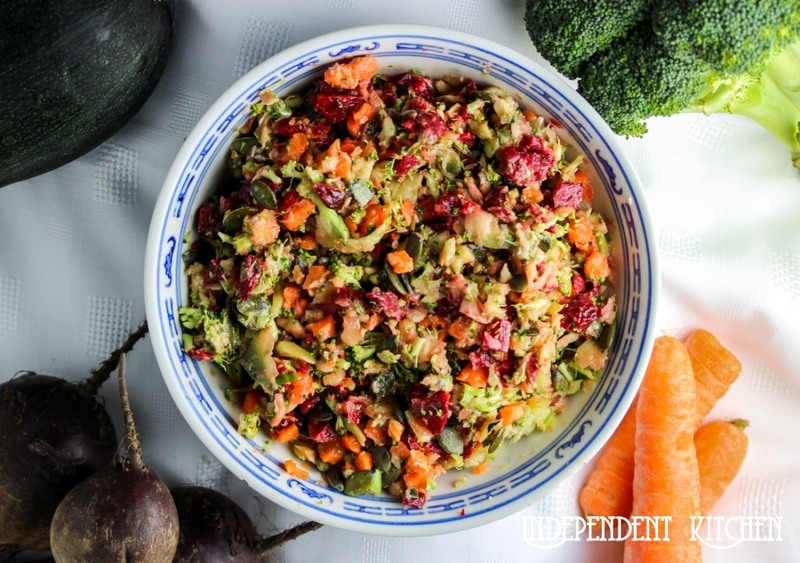 The basil and walnut pesto is also great with pasta, topped over roasted vegetables or served with pita and crudités as a chunky dip. 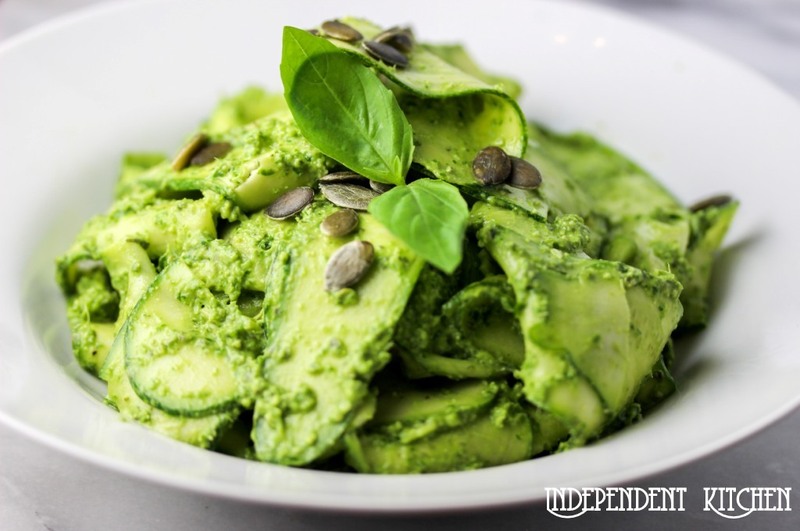 You can also use shop bought pesto if you want to make the recipe even easier! Heat the butter or olive oil in a large saucepan over a medium heat. Wash and finely chop the celery sticks and add to the pan. Saute for 2-3 minutes until the celery begins to soften. Crush the garlic cloves and add to the saucepan, stirring for 1 minute. Add the spinach, crumble in the stock cubes and add enough boiling water to completely submerge all of the contents of the pan. Cover and simmer for 6-8 minutes, then blend. If the soup is too thick add more water. 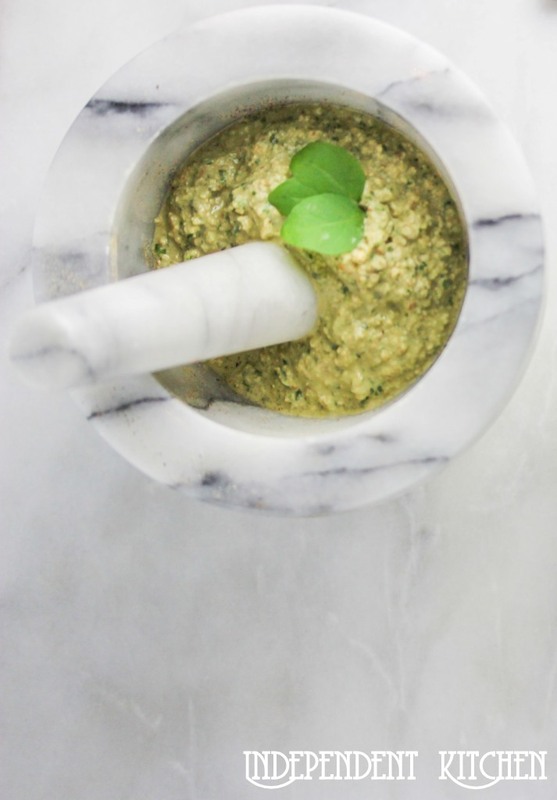 Check seasoning and serve topped with the basil and walnut pesto (recipe below). Add all ingredients to a blender and blend for a minute or so until you have a chunky pesto. What a fabulous soup recipe, I really like it!